With an average snow fall of 16 feet-per-year, Jackson, N.H. is no stranger to snow. As the town’s highway superintendent, it is Jay Henry’s job to keep every inch of it off the roads. Nestled in the White Mountains, Jackson is a picturesque New England ski resort located near Mount Washington, the highest Northeastern U.S. peak. Coined “home of the world’s worst weather”, the mountain produces tornadic winds and local weather patterns that combine to dump Jackson’s bare roads with wet, heavy snow. Six-foot snow banks can accumulate in a matter of hours. The town of 800 swells to several thousand during peak ski season, and Henry, a fifth-generation resident of Jackson, recognizes that having the right equipment to keep the road clear and safe for tourists and residents is his number one priority. Henry worked with Lancaster-based McDevitt Trucks to customize his new Western Star 4800SB model with 109-inch BBC. 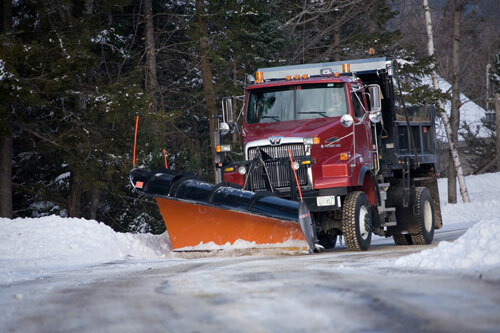 The truck features Western Star’s Super Visibility hood—a design ideal for snow plow applications. The 4800’s 109-inch, super-visibility hood design gave Henry a better view of the road plow and wing equipment and allowed for a shorter wheelbase. Coupled with the truck’s set back axle for proper load transfer to the front axle, the truck provides for maximum safety and maneuverability on Jackson’s steep roads. 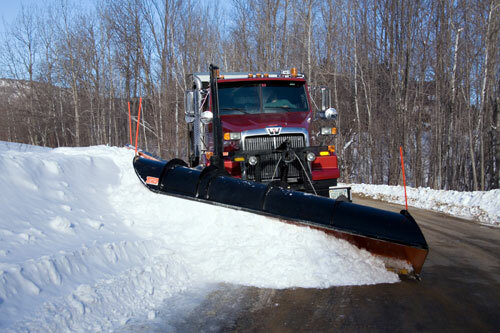 Jackson’s all-wheel drive 4800SB features factory front frame extensions for the 11-foot blade and a 45-degree wing plow to clear a wider area of snow. All hydraulics are powered by the Rear Engine Power Take-Off (REPTO) of the truck’s DD13 engine. The new plow also features a heated front windshield for added visibility, and under hood air cleaners with inside/outside air and dash controls. As a safety measure, Henry ordered factory-installed strobe lamps, which were mounted on the roof to reduce glare. The roomy cab is also outfitted with heated seats, which Henry noted as an especially nice addition. “In a severe storm, we can be plowing alone for anywhere from 12 to 24 hours straight,” said Henry. “This truck made this season’s long rides safer and much more comfortable. “ Tackling Jackson’s steep, snowy roads can be as hair-raising as the ski slopes themselves. Equipped with a 435 hp Detroit Diesel DD13® engine with BlueTec® SCR technology, Jackson’s 4800SB easily outmatched the mountainous terrain and heavy snow. The DD13 also boasts high torque for added maneuverability. Jackson’s 4800SB was also equipped with a rugged, Eaton 8LL transmission—a critical component for smoother shifting even while in four-wheel drive. The factory-installed component was critical for Henry, who prefers to work with a manual transmission.